Orders placed before noon on a business day will normally be despatched the same day while those placed after noon or on a non-business day will be sent on the next business day (subject to stock availability). We may send your order by Royal Mail or courier, depending on the items ordered, the value and weight of the order. Normally all orders weighing over 2kg will go by courier. Our delivery charges are calculated based on the weight of the items in your basket and the best method available to get them to you. We will use the postal service for packages under 2kg but for packages over 2kg we will use a courier service. If your order is for goods over the value of £75 then the shipping is free of charge. For deliveries to the UK mainland the courier and postal deliveries will normally deliver within 2-3 days. Deliveries elsewhere will take a little longer. Delivery charges for orders weighing up to 600g - £3.10. Delivery charges for orders weighing more than 600g but less than 2kg - £4.99. Delivery charges for orders weighing more than 2kg - £6.99 and will be sent by courier. All orders over £75 will be delivered free of charge within the UK mainland. Our courier service requires that orders be signed for on delivery. Please choose a delivery address where someone will be present to accept delivery and sign for it. Where a signature cannot be obtained for the package, the courier's conditions will apply and additional charges may be issued for repeat delivery. Goods not received within 28 days following purchase will be refunded in full. Our hampers will be heat sealed to ensure they are delivered and arrive in good condition. If you wish to include a message with your hamper please use the Special Instructions box at the checkout. We will include a hand written card with your message. 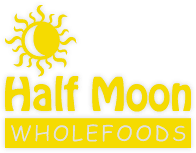 At Half Moon Wholefoods we do our best to follow our principles, one of which is supporting the environment. With that in mind and our aim to ensure that your goods reach you in good condition, we reuse much of the packaging our deliveries to the shop have arrived in. Therefore please expect your delivery to arrive in used packaging. Should you not be entirely satisfied with your product following delivery, you can phone or e-mail us within seven working days following receipt to cancel the sale. You will receive a full refund for the products purchased providing they are returned to us in their original packaging, complete and undamaged. In the unlikely event of your product arriving faulty or damaged, we will offer you a replacement or full refund, providing the product is returned to us. Unopened packs can be returned to us, at your own expense, for a full refund of the cost of the goods up to 30 days after purchase, This refund will be conditional on the packs being received complete and undamaged. All refunds will be issued via the payment method used - with the exception of postal order or cash, which will be issued on a company cheque.